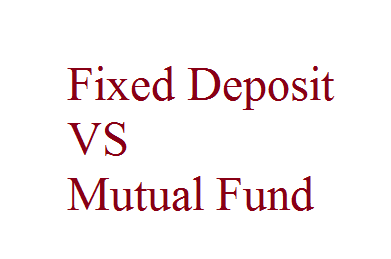 Apply Fixed Deposit | Compare FD Calculator: Why is it better to Invest in FDs than Mutual Funds? Why is it better to Invest in FDs than Mutual Funds? From time immemorial, there have been some momentous questions that have invaded the minds of the rational, clear thinker- the chicken or the egg, democracy or dictatorship, the Beatles or Metallica? For the 21st century investor in you, one of the paramount questions is this- Where must I invest, in fixed deposits or mutual funds? The lure of mutual funds lie in its short term success- your investment, a progressive market, good returns. However, fixed deposit ensures a reliable and steady FD interest rate that remains constant over a short term or long term duration. While this ensures security for your investment, it also sees to it that the chances of you losing money on your FD investment is a very tiny, miniscule percentage, against the constant unreliability of mutual funds. Unlike mutual funds that require a minimum surcharge for the management of investment and distribution of funds, charged irrespective of actual returns gained, a fixed deposit doesn’t require any additional fees to get going. The FD is in place to only earn positive paybacks for the investor without demanding any additional monetary inputs to begin with. True, most FD portfolios are conceived with an intent to invest money for a long duration, however, many banks allow you to withdraw your money prematurely, with a very small penalty (usually 1%). This ensures that you always have a source of ready, liquid cash that can be accessed immediately if situations thus demanded. This shouldn’t play havoc with the FD interest rate too as you will receive an interest rate in line with the duration your money was part of the FD portfolio. On the flipside, mutual funds fine a 1% exit load on prematurely terminated portfolios, while paying out interest on the prevalent Net Asset Value (NAV) that is squarely dependent on the ups and downs of the financial market. Investing in fixed deposits come with an assurance that the FD interest rate that was promised to you at the time of the purchase of the fixed deposit will remain a constant factor through the duration of the policy. Such a promise isn’t a possibility with mutual funds. In the latter, the market decides the fate of your investment- it could be an impressive return in line with the market’s upswing, or you could lose money as the market hits the ground. Bottom line- FD gives you safety, and an assurance of a fixed income on your investment. Fixed deposit is the choice of a safety oriented, smart and optimistic investor, who isn’t willing to cast away his/her hard earned money on the whims of an often volatilemarket. Wonderful article on Low Interest Personal Loans. The interest rate varies and has different funding options. Based on individual requirement these have been designed like this, but if all these options come under one roof then one need not check every bank separately for the exact match of their need. I heard FinFree Enterprise is one such Financial firm who helps people to find and choose the best funding option under a single roof. Let us not waste time which has more value than money. Good learning. Thank you.